Homemade gluten-free funfetti cupcakes. Perfect for bake sales, kids birthday parties, or any day that needs a burst of sprinkles. Preheat oven to 350 degrees F. Line 15 standard muffin cavities with paper liners or grease with nonstick cooking spray. Whisk together gluten-free flour, sugar, baking powder, salt, and xanthan gum. Add oil, water, eggs, vanilla extract, and almond extract. Whisk until smooth. Stir in sprinkles. Fill muffin cups about 2/3 full. 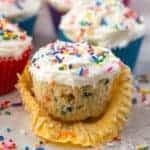 Sprinkle additional sprinkles on top of each cupcake. Bake until set and golden brown, about 15 minutes. Remove from the oven. Allow cupcakes to cool in the pan for five minutes. Transfer to wire rack to cool completely. Once cool, frost with vanilla frosting. Top with additional sprinkles.